“GINZA×CSR” Vol. 30 will introduce GINZA SIX Retail Management Co., Ltd. (a joint-stock company by J. Front Retailing Co., Ltd., Mori Building Co., Ltd., L Catterton Real Estate and Sumitomo Corporation), which manages one of the largest commercial complexes in the Ginza area. 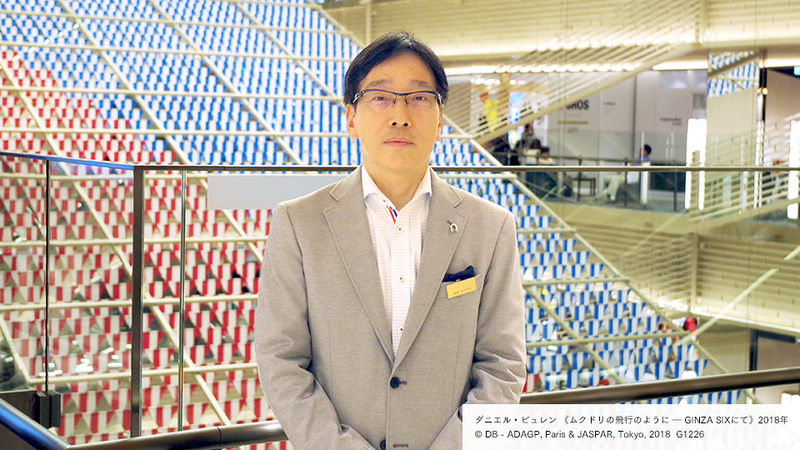 We interviewed Mr. Hirokazu Mitsuda, Director and Head of the Service Planning Office, about CSR at GINZA SIX, which has been spotlighted as a cultural hub of Ginza. ─ GINZA SIX attracted much attention prior to its opening as an establishment that would have a large impact on the development of Ginza. How do you address CSR at GINZA SIX? The redevelopment of Ginza 6-chome was originally launched with an aim to make Ginza an everlasting town. We consulted the landowner and engaged in intensive discussions with the Tokyo Metropolitan Government, Chuo Ward Office and local organizations in Ginza on how we could contribute to the community. As a result of these talks, we incorporated various functions in the establishment. The development plan was formulated during the fifteen years from 2003 but I feel that the ideas for CSR have always been embraced by my seniors from long before. In May this year, we asked our restaurant tenants to close thirty minutes early. Until then, it was a rush for employees to manage to get on the final train home, but now employees are happier because more time gives them more space in their minds. Also, after thorough discussion, we have decided not to open on New Year’s Day so that our employees can take the day off. This is rare for an urban shopping mall, but since Ginza’s department stores and retail shops have always been closed on New Year’s Day, we are only following local practices. We also close the building one day each in summer and winter, to balance work and life. We have a rest area dedicated to workers, with lockers and resting space as well as toilets. There is a comfortable rest area on the seventh floor with a view of the townscape which had not been a part of the original plan. These details are linked to building an uplifting feeling towards work. Given our concept of “delivering authenticity,” we offer those working in the building an educational program that is focused on building on their knowledge and cultural refinement. For example, in October last year, we held a Noh performance for our workers. Around three hundred people came to the show. We also host talks on luxurious hospitality and yoga lessons in the rooftop garden. These experiences have positive effects on private life, as well. We also hold parties that store employees are invited to and encouraged to get to know one another. These parties have become good opportunities for them to make new friends and be mutually inspired. ─ Please tell me how you reflected your passion for the local community and people in developing Ginza 6-chome. We included a corridor in order not to let the introduction of a new building damage the attractiveness of the Ginza itself as well as to achieve increased convenience and improved mobility. From 7 am to 11 pm, people can walk through the building from Chuo-dori to Mihara-dori, on the other side. In December last year, we also opened a barrier-free passage leading to Ginza Station. We have also installed a tourist service center called Terminal Ginza that allows the many tourists we have in Ginza to find the comfort and easiness of having access to both a tourist center and convenience store, which is often referred to as “cool and very Japanese” by foreigners. Tourists can enjoy the one-stop convenience of purchasing souvenirs, exchange moneys, check luggage and use courier services. Since it is meant to be a public facility, we have not used the GINZA SIX logo in its name. In addition, when GINZA SIX opened, many tourist buses parked in Chuo-dori, raising safety concerns. Therefore, we made a bus stop on the Mihara-dori side of the building for tourists to descend from their buses. In preparation for disaster, we have a storage facility with emergency supplies for 3,000 people and the building can be used as an evacuation site. We were careful to design a safe and comfortable space to make Ginza an even more friendly place. naturally blends in with the townscape of Ginza. ─GINZA SIX Garden is a rooftop garden that covers an area of around 4,000㎡. And in Autumn 2017, it received acknowledgement under SEGES (Social and Environmental Green Evaluation System). It is the largest urban oasis in Ginza and we have received many visitors. Greening contributes to reducing the heat island effect as well as CO2 emissions. A total of one hundred different flowers bloom from season to season on tall trees, shrubs and on the wall, and sometimes we can see the Japanese white-eye fly into the garden. Some people come to take a walk and others, to have lunch. It is very functional as a friendly public space for both people and nature. The urban oasis gives comfort to those who visit. ─With the Tokyo Olympics just around the corner, Tokyo’s townscape has been undergoing much change. How do you feel about accompanying changes in Ginza? Since I originally worked for Matsuzakaya Department Store, I have worked in Ginza for a long time. Ginza is, after all, a commercial town that changes in response to commercial activity. The opening of GINZA SIX has stimulated increasing flows of people coming to Ginza. I feel that, at last, I have been able to do something in return for the people of the Ginza community. Ginza is often referred to as a “horizontal town,” which means that most visitors come here with a sense of coming to “Ginza” instead of to a particular destination in Ginza. Therefore, we are consciously involved in what goes on in Ginza as a whole instead of trying to achieve something through GINZA SIX alone. We expect to receive more visitors as we approach the Tokyo Olympic Games. We will always treat our customers with priority and be sure not to cause them stress. ─Please share your thoughts about the future of Ginza. I would hope for Ginza to always represent Japan both in name and in substance, constantly receiving praise from the world. That is what I believe CSR is all about. The world values people-friendly and environment-friendly features. Ginza is often said to be a place for adults. I would hope for the entire Ginza community to engage itself in social activities and become a sophisticated adult. I would proud be a part of such endeavors. Director and Head of the Service Planing Office, GINZA SIX Retail Management Co., Ltd. Graduated from the Faculty of Economics, Nagoya University. Mitsuda joined Matsuzakaya Co., Ltd (currently, Daimaru Matsuzakaya Department Stores Co. Ltd.) in 1987. From 1999, he worked at the Matsuzakaya Tokyo Main Office in Ginza, and assumed the position of General Manager of Customer Policy Division, Tokyo Main Office, Daimaru Matsuzakaya Department Stores Co. Ltd. in 2010. The following year, in 2011, he became General Manager in charge of out-of-store sales. He has been Director of GINZA SIX Retail Management Co., Ltd. since 2014. Having worked for several foreign IT firms, Imai shifted the target of her work to environmental and social issues after participating in the tenth meeting of the Conference of the Parties (COP 10) to the Convention on Biological Diversity as an NGO member. She currently conducts interviews, edits and writes articles, develops educational programs and offers interactive counselling sessions.